If you’ve visited this site more than once, you probably know how much I love tacos. And how much I love spicy food. And how much I love shrimp. So, when you see a recipe that brings those three things together, you know I’m in Seventh Heaven, right? This recipe is really easy to do, but looks and tastes amazing! Other than chopping some stuff up, and cooking the shrimp, there’s nothing to do except enjoy the fruits (er, tacos) of your labor. 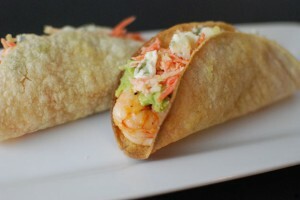 Of course, you can make these for dinner, but I also love them for a weekend mid-day meal. I hesitate to call it lunch, because often it’s the first meal of my Saturday, and can occur anywhere from Elevenses to late afternoon. But enough yakkin’! Let’s go have some fun! Peel and devein shrimp. Rinse, then pat dry with paper towels. Put shrimp in large bowl and pour Buffalo wing sauce over the top. Stir to thoroughly coat shrimp. Refrigerate for 15 minutes. While the shrimp are marinating, get everything else ready to go. Chop your lettuce, cilantro and onions, and cut your lime wedges. Pu tortillas in a warmer and put them in microwave. You want everything to be ready to go as soon as the shrimp are done so you can build tacos. Heat large saute pan or skillet over medium-high heat. When it’s hot, add a tablespoon of olive oil and let it heat until it shimmers. Add shrimp to pan in single layer. 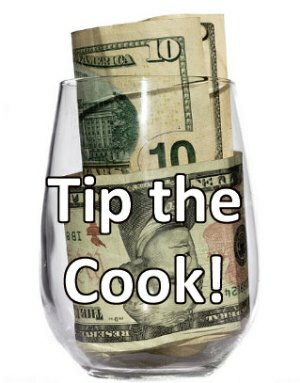 Cook about a minute, then flip and cook a minute or two more – only until cooked through AND NO MORE! Right after you flip the shrimp, start your microwave to warm the tortillas. 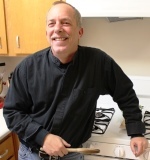 As soon as shrimp are done, use a slotted spoon to remove them from a pan to a bowl. Get your tortillas out of the microwave and start building tacos. Lay tortillas on plates (two at a time). Sprinkle shredded cheese over tortillas. 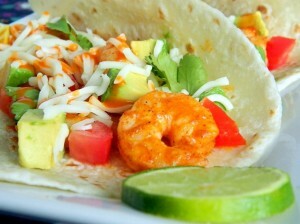 Add some shredded lettuce, then top with shrimp. Next, sprinkle Blue cheese over each taco, then onions and cilantro. Squeeze a bit of lime juice over each one and serve immediately with more lime wedges. Obviously, there are a lot a personal variations; let me share a few I’ve found. 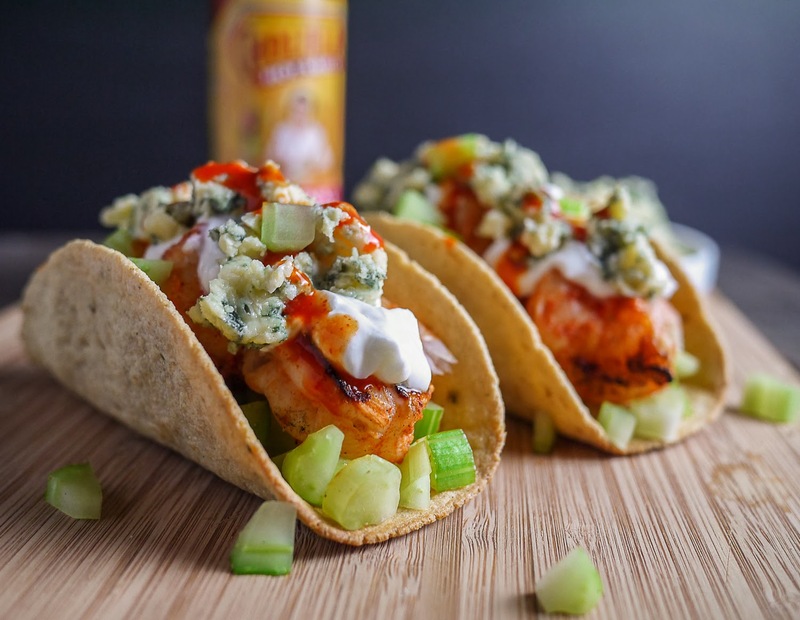 Omit the shredded cheese and go for a bit more Blue cheese to stay closer to the original tastes of Buffalo Chicken. Some folks like to add chopped tomato, avocado and/or celery. 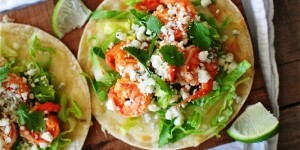 Other folks leave out the lettuce or substitute cabbage, which is a bit more Mexican-traditional. If you do this, I recommend purple cabbage because it looks better. To continue the Buffalo theme, you can shred some carrot and add that in as well. I also know a lot of people who bread, then fry, the shrimp. I’ve tried it and I don’t like it as much as sauteing them, but each to his own, right? In my recipes, I normally use the biggest shrimp I can find. This is an exception, because it’s easier to eat these when the shrimp are a little smaller. But I suggest you use at least Extra Large – 16-20 per pound. Sometimes I know people are going to want seconds. I only cook enough shrimp for the first round, then cook more as needed. This helps make sure each taco is as good as the first, and it only takes a few minutes to whip up another batch of shrimp. You can push this one up a bit by grilling the shrimp. Use two skewers per set of shrimp so that they are easy to flip. Check out more Shrimp recipes here.